Yeah I am done with Auto Chess for now. Until they nerf the crap out of mechs there is no reason to play. Been having a lot of fun with this, just had a few questions. How exactly do items like staff of wizardry work? Does it only apply the debuff on auto attacks? or also ults? For example, would Juggernauts spin apply it to all targets? How about Luna's AA? Also, If you get 2 of the same unit on round 1, is locking to guarantee both a good strategy? Or should I not bother if it's weaker? that's a tough one, I find it's worth it to lock for 3 regulars or 2 druids, but to limit your possibility for an even better hand on round 2 is a huge risk. 1. On auto attacks. Make sure to put it on heros that do aoe damage. Stuff like lina is worthless cause she'll often ult something she isn't even auto attacking. I don't believe Luna's passive AA triggers effects either, could be wrong. 2. Don't ever do this. Only if it's 3 and you can guarantee a tier 2 unit. All things considered your early unit picks don't mean much, so committing so hard for just the chance of a tier 2 unit is too much. Much better just picking a single unit and getting 2 of them appearing on the next board, as well as higher/better tier units. Troll buff(4), Elemental Buff(4), Warlock Buff(3) and Warrior Buff for Troll Warlord, Tiny and Doom. That was a really fun team to play. Attack speed, Lifesteal and a chance for melee attackers to turn to stone for everyone. Troll Warlord and Doom also had good items and were just chewing through the entire team. I didn't realize someone had made a version of Auto Chess in Warcraft 3. All coming full circle. After the end of this month, self-going will usher in a new season, and each stage will have different rewards. The reward gap between the segments is large, but the current reward is still undetermined. At present, the official only reveals the simple message mentioned above. We speculate that, like other games, after the end of the month of the month, each person's level of the position may be reversed, giving the player more room to punch. At present, with the patch-changing environment, and the continuous iteration of strategic innovations (such as the popularity of betting), the self-going chess environment will undergo major changes in a short period of time. How to adapt to the version change at that time, and rushing to high scores every season, will become a compulsory course for every player. Hmmm can't wait, hope they do a little more with the emphasis of ranks and stuff like that, will be interesting to see what they do. Did trolls just get stealth buffed? I had a level 3 Tinker just now. Did feck all when facing trolls. On a Chinese gaming forum, NGA, the devs of DAC will post there from time to time. Today, someone raised the concern that the devs may shift their focus to mobile version and stop updating DAC. The devs replied:" We won't stop updating DAC. Actually, updating DAC will be our top priority and the reference for mobile version. Mobile version just provides more options for people who can't play the game on PC." Don’t worry. 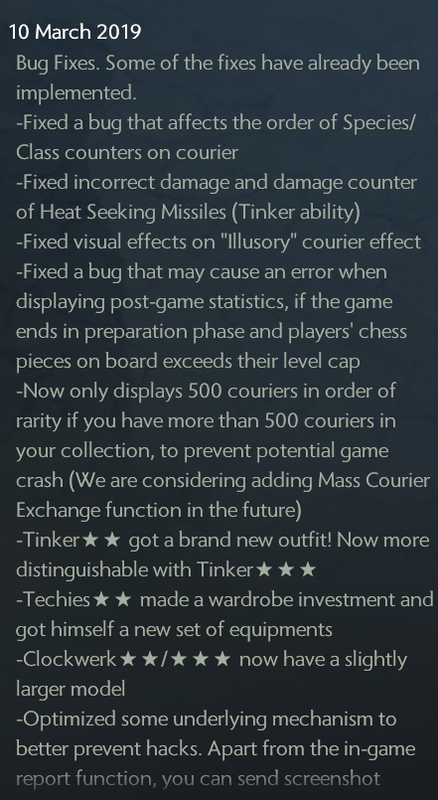 We will continue working on Dota 2 version even after this mobile launched. We will update our English website for this mobile version very soon. Thanks for all your love! We'll see how much that holds true, if they do I'll for sure play both, they have me hooked. Kinda dreamy. Would love to be able to play this on the go. I hope it's as good as the OG. "Good luck with everything - though I hope mobile is not pay to win " "Same as current versions. Money won’t effect balance." I hope hope HOPE they keep with that statement. Probably no AI fighting, instant battles, less upkeep time. losing without being able to see why you lost wouldn't work imo. No AI battles is a deal breaker to me. It's a completely different game without it. Every time I end up making a Doom 3 the game ends that turn. Last time, the opponent died to trolls before I could see the Doom 3 in action. AI battles is a staple of hero brawlers. Pretty much every other mobile hero brawler does it already. If they skip out, it’d be to save on session time. Saw that a bit ago, about time!